Paint for Tennis Courts. Suppliers of Tennis Court Paint and Line Marking Paints. Paint for outdoor sports and MUGA surfaces. Anti-slip, all weather, coloured and white paint for new or old tennis courts. Paints for schools and colleges. Makers and suppliers of Tennis Court Paint. Paint for outdoor sports and games surfaces. A wide range of sports paints, primers, binders, coatings and colours for the professional or DIY refurbishment of sport facilities. Tennis court paint, MUGA (Multi Use Game Areas) and playground surface paint. If you maintain or have responsibility for tennis court maintenance, look no further for your paints and primers. "How much paint do I need to paint a tennis court?" Email for details. Buy Primer & Court Paint together for further 10% reduction. MORE INFORMATION. Technical Paint Services offer our A149 Tennis Court Paint not only in the full BS colour range, but we can also make to a customer's pattern or preference such as the RAL colour reference system; minimum batch sizes apply. A limited range of recycled court paints and coatings for large sports halls is offered for price sensitive or green considerations. Please call us for availability. 01202 295570. 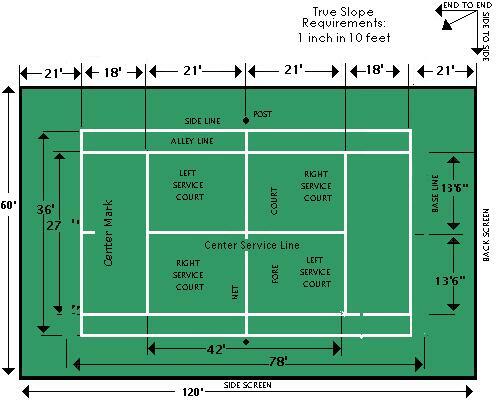 For court dimensions, see our Tennis Court Size Specification guide. SPECIAL OFFER: 11 x 20 Litres of REC149 Tennis Court Dressing for just £440.00+VAT and delivery*. PLUS FREE 5.0 Litres of White Line Marking Paint FOC. Roadline Marking Paint in Black, White and Yellow. An extremely fast drying, durable roadline marking paint suitable for application to concrete, tarmac, asphalt, wood and most other surfaces. Coverage: 30 sq metres per 5.0 Litres per coat @ 30 microns dry film thickness. White Line Marking Paint for outdoor sports and games surfaces. Sports Pitch, Arena and Court Line Marking Paint. A low gloss line marking court paint designed specifically for application to asphalt, macadam and concrete tennis courts. Made with an anti-slip additive. Ideal for tennis courts, playgrounds, sports arena surfaces, MUGAs etc. Surface & Line/Pitch/Court Marking Paints suitable for Multi Use Game Areas. White in 5.0 Litre containers. Coverage: 20 - 30 sq metres per 5.0 Litres depending on porosity of surface. Tennis Court Surface Primer, Preparer/Binder in Grey. A specially formulated water-based, lightly textured pigmented primer designed to help bind and stabilise the tennis court surface as a base coat preparer for A149 or AG149 Tennis court coatings. Available in 20.0 Litre containers in a pigmented Grey finish. Paint for outdoor sports and games surfaces. Need help with your tennis court maintenance? We manufacture and supply an acrylic based, all weather, non-slip tennis court paint suitable for Multi Use Games Areas (MUGAs). See our Special Offer price for Great Value Tennis Court Paint. More information. Coverage: 15 - 20 sq metres per 5.0 Litres depending on porosity of surface. "How much paint do I need to paint a tennis court?" Email for details. Coloured Tennis Court Paint. Technical Paint Services offer our A149 Tennis Court Paint in the full BS4800 colour range, and can also make to a customer’s pattern or reference such as the RAL colour reference system, or indeed the "US Open Blue". See our NEW RAL 6017 Green in situ at the St Pierre Park Hotel, Guernsey. Line & Court Marking Paint available in Yellow, Red, Green, Blue, Orange & Black colours in 5.0 Litre containers. Grey Tennis Court Surface Binder. Also available to help prepare your court for re-painting: Tennis Court Surface Binder/Preparer. A specially formulated water-based, lightly textured pigmented primer designed to help bind and stabilise the court surface as a base coat for A149 or AG149 Tennis court coatings. 11 x 20 Litres of AG149 Tennis Court Paint*. This amount of paint should be sufficient for a standard size court and average size "out of play" area. AG149 Tennis Court Paint. APRIL OFFER: AG149 Storm Grey 11 x 20.0 Litres WAS £985.00 - April only NOW £885.00! Low price tennis court paint. A single pack water based coating, designed for application to porous, allweather macadam Tennis Courts, Playgrounds and other Sports/MUGA Surfaces (including asphalt and concrete). AG149 has been formulated and developed using water-based acrylic resin technology, providing an environmentally safe, non-slip playing surface containing the required player/surface/ball interaction characteristics. Also suitable for car parks and other public areas. Coverage: 15 - 20 sq metres per 5.0 Litres depending on porosity of surface. This amount of paint should be sufficient for a standard size court and average size "out of play" area.